Poodles are retrievers or gun dogs, and can still be seen in that role. The poodle is believed to have originated in Germany, where it is known as the Pudel. 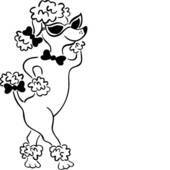 The English word "poodle" comes from the Low German pudel or puddeln, meaning to splash in the water. The breed was standardized in France, where it was commonly used as a water retriever. The American Kennel Club states that the large, or Standard, Poodle is the oldest of the three varieties and that the dog gained special fame as a water worker. So widely was it used as retriever that it was bred with a moisture-resistant coat to further facilitate progress in swimming. All of the Poodle's ancestors were acknowledged to be good swimmers, although one member of the family, the truffle dog (which may have been of Toy or Miniature size), it is said,... never went near the water. Truffle hunting was widely practiced in England, and later in Spain and Germany, where the edible fungus has always been considered a delicacy. For scenting and digging up the fungus, the smaller dogs were favored, since they did less damage to the truffles with their feet than the larger kinds. So it is rumored that a terrier was crossed with the Poodle to produce the ideal truffle hunter. Despite the standard poodle's claim to greater age than the other varieties, there is some evidence to show that the smaller types developed only a short time after the breed assumed the general type by which it is recognized today. The smallest, or Toy variety, was developed in England in the 18th century, when the Havanese became popular there. This was a sleeve dog attributed to the West Indies from whence it traveled to Spain and then to England. The continent had known the poodle long before it came to England. Drawings by the German artist, Albrecht Durer, establish the breed in the 15th and 16th centuries. It was the principal pet dog of the later 18th century in Spain, as shown by the paintings of the Spanish artist Francisco Goya. France had toy poodles as pampered favorites during the reign of Louis XVI at about the same period. The Poodle is a breed of dog. Poodles, commonly known as French Poodles were discovered as a wild species in the outskirts of Paris France in the 12th century. Commoners were curious as to the interesting grouping of curly hair found on various locations on their body. The Standard Poodle is regarded as the second most intelligent breed of dog after the border collie, and before the German Shepherd. The poodle breed is found officially in toy, miniature, and standard sizes, with many coat colors. Originally bred as a type of water dog, the poodle is skillful in many dog sports, including agility, obedience, tracking, and even herding. Poodles are elegant in the conformation ring, having taken top honors in many shows, including "Best in Show" at the Westminster Kennel Club Dog Show in 1991 and 2002, and at the World Dog Show in 2007 and 2010. Unlike many breeds, poodles can come in a variety of sizes, distinguished by adult shoulder (withers) height. The exact height cutoffs among the varieties vary slightly from country to country. Non-Fédération Cynologique Internationale kennel clubs generally recognize three sizes, standard, miniature, and toy, sometimes as sizes of the same breed, and sometimes as separate breeds. The Fédération Cynologique Internationale recognizes four sizes of one breed, standard, medium, miniature, and toy. Only the Fédération Cynologique Internationale describes a maximum size for standard poodles. France is the country responsible for the breed in the Fédération Cynologique Internationale, and in this country the puppies of all sizes are listed together. The terms royal standard, teacup, and tiny teacup are marketing names, and are not recognized by any major kennel club. Poodles are often cited as a hypoallergenic dog breed. The poodle's individual hair follicles have an active growth period that is longer than that of many other breeds of dogs; combined with the tightly curled coat, which slows the loss of dander and dead hair by trapping it in the curls, an individual poodle may release less dander and hair into the environment. In addition, most poodles are frequently brushed and bathed to keep them looking their best; this not only removes hair and dander but also controls the other potent allergen, saliva. Although hair, dander, and saliva can be minimized, they are still present and can stick to "clothes and the carpets and furnishings in your home"; inhaling them, or being licked by the dog, can trigger a reaction in a sensitive person. A vacuum cleaner with a HEPA filter can help clear dander floating in the air. The word hypoallergenic, when referring to a dog, is also a misconception; all dogs shed. Poodles shed hair in minimal amounts, and also release dander, but are not as likely to trigger allergies as much as many other breeds. The most common serious health issues of standard poodles (listed in order of the number of reported cases in the Poodle Health Registry (as of August 20, 2007) are Addison's disease, gastric dilatation volvulus (GDV = bloat/torsion), thyroid issues (hyperthyroid and hypothyroid), tracheal collapse, epilepsy, sebaceous adenitis, juvenile renal disease, hip dysplasia, and cancer. Standard poodles are also susceptible to some health issues usually too minor to report to the poodle health registry. The most common of these minor issues are probably ear infections. Ear infections are a problem in all poodle varieties. Ear problems can be minimized by proper ear care. A veterinarian should be consulted if the dog shows signs of an ear infection. Otherwise notable is this breed's keen sense for instinctual behavior. In particular, marking and hunting drives are more readily observable than in most other breeds. Even Toys will point birds. Classified as highly energetic, poodles can also get bored fairly easily and have been known to get creative about finding mischief. Poodles like to be in the center of things and are easily trained to do astonishing tricks involving both brains and agility. They have performed in circuses for centuries, beginning in Europe, and have been part of the Ringling Circus in its various forms from its inception. The Grimaldis, the famous British clowns Kenneth and Audrey Austin, "developed a stronger circus act" with a clever poodle named 'Twinkle,' the success of which allowed them to continue performing even as octogenarians." Poodles are extremely people-oriented dogs and generally eager to please. Standard poodles in particular tend to be good with children. Poodles are adaptable and easy to train, but sometimes their intelligence can make them obstinate and stubborn. Like most dogs, they appreciate daily exercise, such as a walk or a play session. Most are fairly agile and athletic. Toy poodles will play ball and love to fetch. Play time is vital, but one must be sure that they get plenty of rest following long play periods and that fresh water is available at all times. Poodles are very easy to housebreak. Whether going outside or being trained on a pad, they learn quickly where to defecate. They are still animals, however, and they need time to understand what is desired of them. It may take a while, but poodles are quite smart and learn more quickly than most dogs. Watchdog, agility, competitive obedience, and performing tricks.